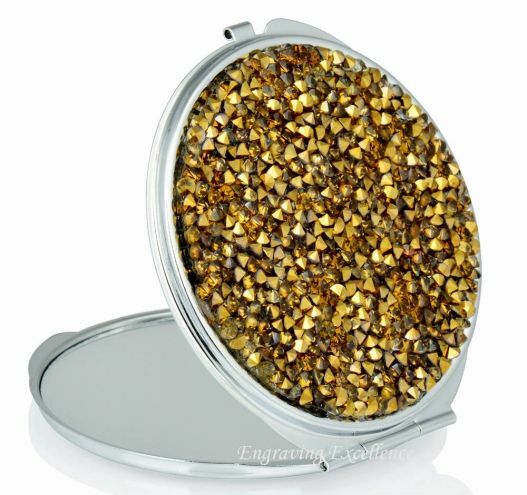 An engraved compact mirror UK can be not only a stylish gift but also very practical too. It is good for someone who likes to look good even on the go, and is easy to carry, but by putting the right message on it, you can expand its practical uses. People love to mark the dates of any special event in their lives, such as when someone was born, got married or a significant anniversary. Engraved gifts are a good way of commemorating such occasions, and there are many items that can be personalised in that way. One such useful addition to any woman?s possessions is an engraved compact mirror. Beyond its practical uses, for checking hair and makeup and so on, there are also other valuable benefits. A compact mirror with a name and a date can be given to signify an important event, which will evoke fond memories long into the future. Engraving personal details onto it can also help protect its ownership. If you have ever lost your handbag at a party, for example, you?ll know the advantage to be had from having a unique personal item inside that can help identify who the bag belongs to and ensure a safe return. In a worst case scenario, a compact mirror personalised with the owner?s name can even act as an identification object in case the holder becomes involved in an emergency of any kind. It may seem trivial, but an engraved gifts truly is one of a kind, and can be useful when trying to identify a person. Practical and stylish ? an engraved compact mirror UK can be both. There are many designs you can choose from, so why not browse our collection of beautiful compact mirrors at Engraving Excellence? We can engrave your message free of charge, so why not use this opportunity to personalise your gift for the one you love? Visit us at http://www.engraving-excellence.co.uk/ for more details.